Met up with Elisabeth, Alicia and Priscilla (aka Miss Jagung) for some catching up after the pageant at Marmalade for dinner. 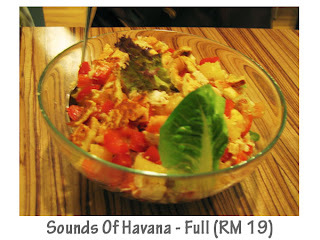 We ordered the Sounds of Havana, Moroccan lamb shank, spaghetti aglio olio, spaghetti smoked salmon and a turkey & mushroom quiche to share. We were very very hungry, especially Priscilla. 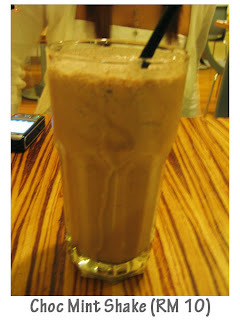 My choc mint shake was quite nice…though I couldn’t really taste the mint. Maybe they should call it choc shake instead. Pris and Alicia tried it and said it was good. Priscilla didn’t like her Zero Thirst. I didn’t try it so I can’t comment. 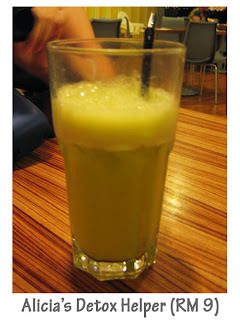 I think Alicia was thirsty because she drank her drink before I manage to snap a shot of it. 😛 Forgot to take a picture of Elisabeth’s cappuccino (RM 7). The salad was the first to arrive. 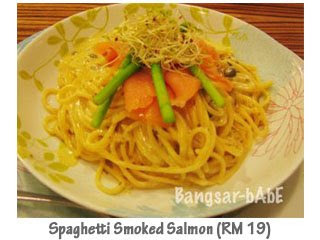 Followed by the quiche, spaghetti aglio olio, lamb shank and finally the spaghetti smoked salmon. The salad, comprising of red & yellow capsicums, pineapple, coconut salsa, chicken chunks, nuts, haloumi and lettuce was as delicious as it looked. I reckon the chicken and nuts ratio was more the last time I dined there. Nevertheless, it was still yummy and I’m pretty sure the girls enjoyed it. (Pardon the not so nice photos. I had to quickly take the pictures, as Priscilla was REALLY hungry. Elisabeth and Alicia had to hold her back for me.) 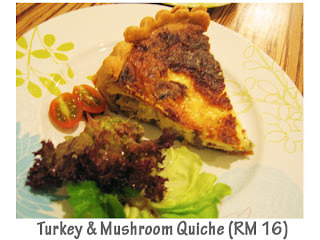 The quiche was alright; the combination of mushroom, cheese and turkey in egg mixture was light and smooth. While Elisabeth thought it lacked flavour, I found it just right as I liked how they added milk or cream to give the egg custard a creamy texture. 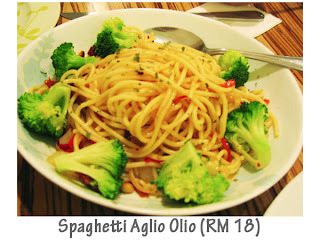 The aglio olio was pretty good. Al dente spaghetti tossed in olive oil, garlic, finely chopped parsley, herbs, red pepper flakes and topped with freshly grated parmesan, Priscilla was in heaven. We polished of the plate within 2 minutes. 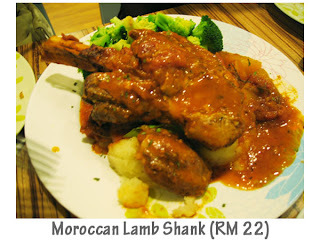 We thought the lambshank was not bad but Elisabeth disagreed. She’s super sensitive when it comes to lamb as she can’t stand its gamey smell. I agree that the lamb was a bit gamey probably because it was of the frozen sort. I switched the briyani rice to mash potato which went down well with the girls as they enjoyed mopping up the spicy sauce with it. Beautifully presented, the spaghetti was well coated in white creamy sauce and fragrant olives bits. The spaghetti smoked salmon was my favourite of the two pasta dishes.Topped with smoked salmon slices, asparagus sticks and Marmalade’s signature alfafa garnish, it was delicious. However, after having really delicious smoked salmon at The Spread every morning, I feel that the salmon is Marmalade pale in comparison to the former. Marmalade’s carrot cake has always been consistently good and this time, there was no exception. The cake was oh-so-moist and generously loaded with shredded carrots and walnuts. The cream cheese coating was rich and slightly tangy which made a great pair with the rich, sweet cake. I love the candied orange zest on top of the icing, and the girls let me have it all to myself. 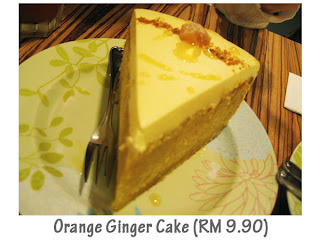 We also shared a slice of Orange Ginger Cake which was relatively new in the menu. It was a huge slice, almost double the size of the carrot cake. I doubt they will maintain that sizing seeing how the petrol cost has escalated. 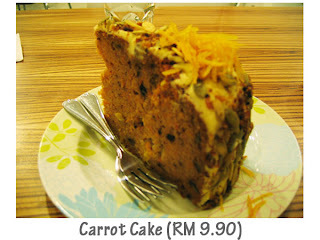 The cake texture was not bad; very light and buttery compared to the dense carrot cake. I found the icing too grainy, I think they didn’t cream it properly. It would have been great if the icing was smooth. All in, it was a lovely dinner and great company. The bill came up to RM 171.10 for the 4 of us. Yes, 4 girls polished of 5 dishes and 2 cakes. Beat that. 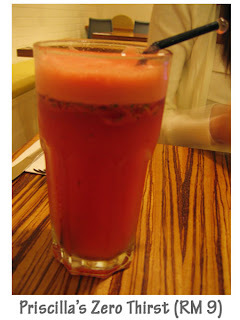 Like I said, Marmalade is one of my favourite places to catch up with friends and enjoy good food. What’s next girls? *Refer to my previous blog entries here & here.